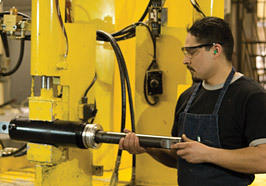 Fisher Hydraulics is a leader in manufacturing quality custom engineered hydraulic cylinders. We have remained committed to delivering excellence, having manufactured solid solutions for the toughest applications. We serve the agricultural, railroad and aerial work platform industries as well as many others that require custom hydraulic cylinders that are able to stand up to demanding conditions. We are a manufacturer of custom engineered hydraulic cylinders for a wide range of industries and applications. Our capabilities include CNC machining, auto welding processes, celluar machining and assembly concepts.